The Office of the Auditor-General announced today it is to investigate controversial investment activity by Dunedin City Council company Delta Utility Services. A media statement said the Auditor-General has decided to carry out an inquiry into decisions in 2008 and 2009 by Delta, a council-controlled trading organisation, to invest in residential developments at Luggate, near Wanaka, and at Jacks Point, Queenstown. The inquiry will examine the nature of the related decision-making process by the Delta board, including how it identified and managed conflicts of interest, the extent of its consultation with the council on the transactions, and its legislative compliance. The Delta board has consistently declined to give details of the investments, in spite of intense questioning by Southland Times community newspaper in Dunedin, D Scene. This latest scrutiny comes after a campaign by rebel Dunedin councillor Lee Vandervis during the past two months, following poor financial results from parent company, Dunedin City Holdings. However, the Auditor-General’s Office statement said this inquiry was sparked by a request by Dunedin Mayor Dave Cull. It said Delta acquired a 50 per cent interest in a joint venture for residential property development at Luggate in 2008. “In 2009, Delta acquired 9.4 hectares of land at Jacks Point, for the same purpose. “The combined cost to Delta was $14.12 million (comprising Luggate joint venture at $5.3 million and Jacks Point land at $8.82 million). The statement noted a subsidiary of Delta, Newtons Coachways (1993) Ltd, was involved in the transactions. The company was re-named Delta Investments Ltd in July 2011, it said. There are people who believe local councils should own businesses because they generate returns and ease the burden on ratepayers. Chalkie is not one of them. Poppycock, you say. Show me a single case of a council’s emptyheaded pursuit of unprofitable goals. In response, Chalkie invites you to consider Dunedin. In that southern city the council is the proud owner of Dunedin City Holdings, whose job, according to its report, is “to manage the commercial investments of the Dunedin City Council to maximise returns”. The businesses under DCH’s umbrella include electricity network company Aurora, forestry company City Forests, the Taieri Gorge Railway Company and an engineering business called Delta Utility Services. DCH’s 2012 numbers are not yet available, but last year it trumpeted an improvement in revenue and profit and a total cash return to the council of $23.2 million. If you thought that was a good result, you’d be wrong. When you look at several years of DCH numbers a disturbing pattern emerges of ever-increasing millions being borrowed and pumped into underperforming assets. The cashflow statements tell the story. In 2007 DCH made $42.7m from its operations and invested a net $50.6m in new assets. After paying a $12.5m dividend it was looking at a cash shortfall for the year of $20.4m, so it borrowed an extra $20.8m. Subsequently, each year DCH invested more money in various assets – $61m in 2008, $90m in 2009, $106m in 2010 and $125m in 2011. However, despite investing more than $430m over those five years, DCH’s profits actually shrank. And each year it had to borrow more to fund those investments: $58m in 2008, $70m in 2009, $124m in 2010 and $66m in 2011. As a result, DCH’s external debt ballooned from $245m to $534m over the period. That, by the way, does not include the amount it owes the council, which was $112m at last balance date, up from $103m in 2007. A picture therefore emerges of a group prioritising asset growth over profit growth, and staying cashflow positive, just, through heavy borrowing. Chalkie suggests another term for this behaviour is empire building. Of course, it could be justifiable if the asset build-up is value enhancing in the long term, but is it? Going by some of the deals involving one DCH subsidiary, Chalkie doubts it. Delta Utility Services styles itself as a “multi-utility service contractor that provides a range of civil, electrical and other services to local authority and private sector clients” – ie, drainlaying, installing cabling and the like. Fair enough, you could say. Councils often have in-house contractors and Delta has simply been given freedom to take on other work and make money for the council. Among the work Delta took on was servicing a subdivision at Jack’s Point, near Queenstown. DCH accounts show Jack’s Point was a good customer: Delta and sister company Aurora sold services to Jacks Point Ltd worth $3m in 2007, $4m in 2008 and $3m in 2009. On June 6, 2009, Delta announced a new long-term contract to provide services to Jacks Point Ltd, saying it was “a genuine and timely good news story, especially for Delta’s employees”. As well as estate management services, Delta was appointed preferred contractor for all future development work at Jack’s Point. Oddly, the next year’s accounts, till June 2010, show Delta sold no services to Jacks Point Ltd. The transactions were specifically disclosed because Delta director Mike Coburn – also, until last October, a director of DCH – was a director of Jacks Point Ltd until December 2008. He also had a 15 per cent interest in Jacks Point Ltd between 2004 and 2006. Chalkie would be interested to know what may have encouraged Delta to do more than provide services. In May 2009, Delta bought 9.4 hectares of land at Jack’s Point from Jacks Point Ltd. The terms were not revealed at the time, but property records show the price paid was $8.82m, with settlement deferred until April 2010. Chalkie reckons this investment matches an $8.82m “development property” asset carried on DCH’s books as “current assets held for sale”. Three years on from the acquisition, Chalkie sees little sign of the land turning into good money for Delta – there’s no shortage of sections already for sale at Jack’s Point, and for what it’s worth, the council’s rating valuation in July last year was $4.25m. A similar picture can be discerned from another DCH land investment in the Queenstown Lakes area, this time in the blink-and-you-miss-it settlement of Luggate, 13km from Wanaka. In early 2008 Delta went into business with South Island investor Jim Boult, forming a joint venture to develop property in Luggate. DCH accounts show the council invested $5.3m in the Luggate joint venture; property records show the investment took place in July 2008. Delta’s report for 2009 shows in July 2008 it also “became party to an agreement that provided it with preferred-contractor rights to a substantial development in Luggate”, although it didn’t mention it was half-owner of a substantial development in Luggate. Chalkie reckons it must be a lot easier to win service contracts if you part-own your customer – but perhaps Delta just liked the project so much it bought into the company. At balance date last year the project was still on DCH’s books valued at $5.8m. Chalkie, having a passing acquaintance with Luggate, reckons the council shouldn’t hold its breath for a return on that investment. Anyway, returning to Jack’s Point. In April this year Queenstown Lakes District Council declined a resource consent application to develop a contractor’s depot at the entrance to Jack’s Point. The applicant was Henley Downs Farm, a company associated with Jack’s Point developer John Darby, and the depot was to be used by Delta Utilities. The land concerned was owned, not by Delta, but by Henley Downs Farm. So although Delta had bought substantial land within the development, it aimed to lease further property from the developer to house its operations. This appears to contradict a statement in DCH’s 2009 annual report saying “land purchased at Jack’s Point will be used to consolidate and expand [Delta’s] Queenstown/Frankton operations”. To Chalkie’s eye, this sequence of events adds up to a woeful deployment of council capital and supports his view that councils should be kept away from businesses in the same way you keep children away from matches. Failure to do so can turn assets into ash. Chalkie is written by Fairfax Business Bureau deputy editor Tim Hunter. Sidebar published in print edition is included below. The prospect of yet more glittering new stadiums being constructed by ambitious city fathers – as being debated right now in Christchurch and Auckland – is being met with scorn by some in Dunedin. They speak from the experience of the saga of the Forsyth Barr Stadium, a building that has left a city divided and its ratepayers facing vast debts. A covered stadium was a grand concept for a city of just 125,000. With significant “private finance” support, the cost to the taxpayer would be capped at a mere $91million and the stadium delivered to the dollar at a total cost of just $188m. Now it’s been built, there remains debate on quite how much it actually cost. Its creator says it came on time, on budget. Some critics argue double that. Dunedin council engaged consultants PricewaterhouseCoopers to give them a figure, and explain any blowout. 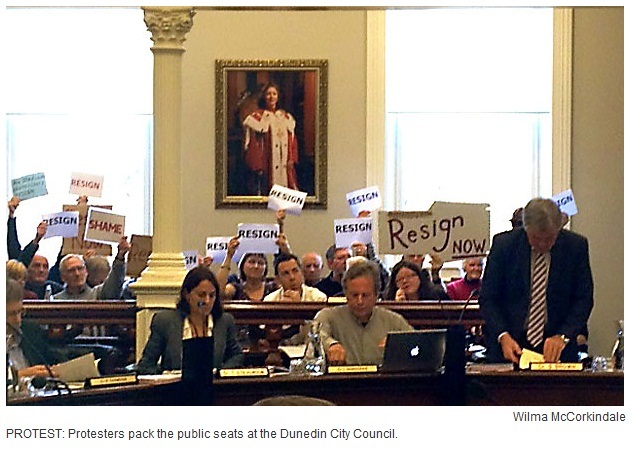 Dunedin mayor Dave Cull, who took power on a broadly anti-stadium ticket, is weary. “It’s now about how we shape the future,” he says. The story of the stadium begins with its predecessor, Carisbrook (nickname: House of Pain), which had hosted rugby tests since 1908. Two miles from the city centre, its bleak terraces hosted generations of blue-and-yellow-scarved students. But by 2003, it was considered antiquated, with appeals to council by the already financially troubled Otago Rugby Union for redevelopment funds. So Dunedin City Council set up an advisory group to consider the options. By 2006, that group had been replaced by the Carisbrook Stadium Trust (CST), chaired by local dentist Malcolm Farry, chairman of the Highlanders rugby franchise and hate figure for the anti-stadium lobby. By February 2007, Farry had produced a plan for a $188m roofed stadium at Awatea St.
A year later, the council resolved to build it, and the finished stadium opened in time for the Rugby World Cup in August 2011. Between those bald facts are five years of internecine warfare in Dunedin, three High Court actions, claims of conflicts of interest, a divided council, a pile of debt and an even bigger pile of documents. The stadium itself, most agree, is an iconic, stunning building. They don’t agree about much else. The study of Bev Butler’s home in City Rise is filled with box files, the product of perhaps a thousand requests under freedom of information legislation that has ferreted out many news stories and serially embarrassed the trust, the council and the rugby union; she once received, in error, an email from the new stadium’s commercial manager, Guy Hedderwick, intended for his boss Ewan Soper, asking: “Hi Ewan – at what point do I tell her to piss off – regards Guy”. Butler was president of protest group Stop the Stadium, which mounted two unsuccessful court cases to prevent construction, then was wound up by the council for not paying its legal costs quickly enough. She experienced both ends of the spectrum: from several chaps turning up unannounced at her front door to hand over $1000 donations to the cause, to telephoned death threats. Stop the Stadium’s death left the remaining anti-stadium lobby disparate, but still vocal. They argue that the stadium was rushed through without real consultation, financial models were hopelessly optimistic, there were serious conflicts of interest, ratepayers should not be propping up professional rugby in the city and Dunedin simply couldn’t afford it. Farry, meanwhile, is eloquent and exasperated, saying he’s sick of “mischief makers” and feels he has answered his critics a “hundred times; they just don’t listen”. He has ready-made answers for each of the criticisms of the stadium. “We’re excited and delighted we were able to achieve something of lasting value to this community,” he says. Major debate and valid questions remain about how the stadium was funded and built and whether the council made the right decision to throw in so much public money (originally $91m, but later $148m) as explained in the sidebars to this story. But even one of the stadium’s opponents, “What If Dunedin” blogger Elizabeth Kerr, says the continuing arguments have caused Dunedin to “stagnate” and ignored the need to regenerate the city. Now it’s about making the stadium work. The “anchor tenant” is financially troubled Otago rugby, recently bailed out by the council; council could hardly afford to, but did so, says Cull, because it needed to keep Otago rugby in the stadium and in the hope they would pay off small local creditors. Bizarrely, in a near dictionary definition of ungratefulness, Otago’s chairman and vice-chair are suing Cull for libel after he criticised the union’s management. The stadium was pushed as a multi-purpose venue. An appendix to the “CST Feasibility Masterplan Report” of 2007 said it was important it was “perceived at a community level to be multi-purpose and cater for more than rugby”. Since it opened last August, only two major non-rugby events have been held: a gig by Elton John, and the 150th birthday celebrations for Otago Daily Times publishers Allied Press. Neither paid a stadium hire fee. In June 2008, two major concert promoters had told the D-Scene newspaper what should have been self-evident: Dunedin was too small, remote and student-oriented to provide the sales base to attract big-name acts. In February this year, council-owned stadium management company Dunedin Venues Management Limited’s (DVML) chief executive David Davies said concert bookings for the stadium would be “thin” in 2012. “What’s thinner than one?” asks Garbutt. Cull says the council has to leverage the advantage of having a roof, guaranteeing events won’t be rained off. Farry, who wanted to run the stadium for its first two years, is disappointed the council hasn’t attracted more concerts. The council envisaged DVML would return a substantial annual dividend to help defray loan repayments. Incredibly, DVML were told to borrow money, if they had to, to ensure a return. “There is no way a company could be milked like this without blowing apart at the seams,” says University of Otago academic Rob Hamlin. DVML duly baulked, the board was sacked and replaced by new directors, Denham Shale and Bill Baylis, both former South Canterbury Finance board members. “A 100 per cent commonality of board membership with a company described as the biggest corporate fraud ever in this country takes real genius,” laughs Hamlin. DVML predicts a $2.4m loss this year, saying it cannot cover the cost of debt-servicing on the stadium loans, and Davies cried at a press conference to announce his resignation. Cull says it was “completely unrealistic” to expect the stadium to service its own debt (it was originally predicted to make an annual profit of around $100,000); instead he’s instigated a review to find the best operating model and how it can run at the lowest possible cost. Hamlin argues it may never be viable: if it cost $200m in loans, that means raising $500,000 a week to cover the interest. “Every person from the child born yesterday to the octogenarian blowing bubbles down the old folks’ home would have to go to that stadium once a week, without fail,” he says. Garbutt believes it would be most sensible to mothball the stadium. Exarcerbating Dunedin’s precarious finances is that while the stadium was being built, the city also upgraded sewerage, the town hall, the Regent Theatre and the Otago Settlers’ Museum. “In hindsight, you wouldn’t do them all together … we already had enough capital spending on our plate,” says Cull. “The spending of the last decade is a habit that is proving hard to shake,” says anti-stadium councillor Lee Vandervis, now advocating huge cuts, including closing the council’s entire PR department. Garbutt argues Dunedin has sacrificed “opportunity cost”. There’s no chance of the council taking on any major projects in the medium term because it has no money. PwC concluded that, with interest, the stadium eventually cost $224m, a four per cent or $36m over-run, a figure mayor Cull accepts. But stadium critic Calvin Oaten calculates the final cost, all things considered, at $485m, though that considers interest which wouldn’t normally be included in such calculation. “But the costs of putting the stadium in place will, over time, pale into insignificance when we take into account the cost of owning and operating it,” he warns. The council owes $602m, which the Otago Daily Times calculated was $4778 per resident. It’s an increase of 1700 per cent on debt levels 12 years ago. But, says Hamlin, it’s actually much worse: the high student population means a low number of ratepayers, so each now bear an $11,377 debt. The council has fixed the debt over 23 years, instead of 40, and managed to cap rate rises at five per cent instead of a projected 12. That, at least, will be some comfort to Hamlin, who had a vision of his 11-year-old son still paying for this stadium almost into his retirement years. Brown, the council finance chair, says it means just $79.30 per year for each ratepayer to pay for the stadium. Compare that to the proportion of rates they pay for things like the Moana Pools and the libraries and reckons Farry that “will look like grocery money in 20 years’ time, and they will continue to be brilliant pieces of infrastucture”. It’s hard to know what the community feels. Before the stadium was built, surveys commissioned by the council (split), the trust (wildly in favour) and Stop the Stadium (heartily against) were all criticised for their methodology. Now, believe Farry and Brown, the community – bar those mischief makers – are in favour. Former mayor Peter Chin, who lost the election to Cull in 2010, isn’t so sure. “I believe it is money well spent … but maybe perhaps many of the citizens didn’t, otherwise I might not have lost the last election,” he says wryly. It can’t be fun being a city councilman: “Resign” and “Shame” are a taste of the banners waved at the last council meeting. 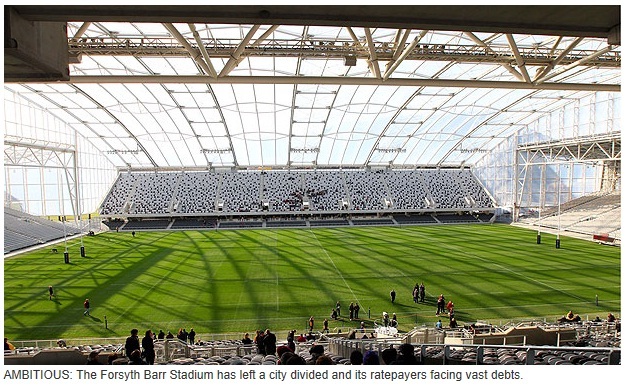 Dunedin council must bear the plaudits and the criticism for the Forsyth Barr Stadium: in February 2008, it pledged $91.8m to build it. That was subject to conditions: Carisbrook was sold, the Otago Regional Council contribute $37.5m, “private sector funding” produced $45.5m, the Otago Community Trust gave $20m and a working party found ways to cut ratepayer commitment by a further $20m. Two independent peer reviews were commissioned. One, from PricewaterhouseCoopers, cautioned the stadium couldn’t rely on concerts as a base income, said revenue forecasts were “at the upper end of expectations … we would not describe them as cautious”, and called overall forecasts “not conservative”. The other, by consultants Davis Langdon, who were given a three-week deadline and not given all documents they asked for from the CST, identified doubts over cash flow, maintenance, the planned realignment of SH88 to accommodate the new stadium, operational budgets, the exclusion of depreciation and interest and found 30 exclusions from the final costs, such as kitchen fit-out, electronic turnstiles and replay screens. The council needed to “ensure they had a holistic view” of overall costs, they said. By the time of the final decision a year later, the OCT had cut its share by $3m, it was apparent little private sector funding would emerge until 2011, and the council had an additional underwrite commitment of $15m, although central government had given $15m. A $10m contribution from the University of Otago was also somewhat illusory. It proved not a direct contribution, but mainly for land for a new university building on the site and shared space such as the stadium plaza. Vice-chancellor David Skeggs once remarked that it could not “extend to any investment in seats or turf”. The stadium cost rose to $198m, the $20m cuts could not be found, and council, in total, was up for a $148.5m share of the project, not $91m. They pushed on. Were council asleep at the wheel? That claim angers the then deputy mayor, Syd Brown, who says not only did the report author not interview any councillors except mayor Cull, the advice council gathered came, in part, from the very same company. Stadium opponents such as Bev Butler and Elizabeth Kerr say their interest, and opposition, was piqued by the apathy they saw when observing these council meetings. Vandervis mentions Massey University academic Sam Richardson’s paper “Oasis or Mirage”, which studied the impact of Wellington’s Westpac Stadium and concluded it had no long-term impact on the local economy or employment, and that stadiums were usually unprofitable. Both Chin and Brown see the stadium as a catalyst for Dunedin’s revitalisation, and say new plans for a five-star hotel on the city waterfront show it’s already having an impact. But Dr Richardson says expectations for the stadium were “off the mark” and it would never be an economic stimulant. The following was published as a sidebar in the print edition but was not available online. Council wasn’t meant to bear all the weight of the stadium: a much spruiked “private sector finance” contribution was kicking in $45m. The latest PricewaterhouseCoopers report says just $700,000 of a promised $45m had been found by last November (two months after opening day), and reported how various updates to the council scaled back the timing of that funding from 100 per cent received before completion to just three per cent. Peter Chin says when he left office in 2010, it was “on track”; however his successor, Dave Cull, dismisses the private sector finance (PSF) as “risky”. It’s argued, perhaps validly, the PSF was really just advance operating revenue: it wasn’t philanthropic donations but long-term seat sales, sponsorships and lounges. If used to fund the build cost, it begs the question: what would offset operating costs once it was open? In an email to Bev Butler in March 2010, Malcolm Farry said “donations, sponsorships, sales of product and funds raised all have a donations component included”. Now he’s exasperated by the PSF question, telling the Star-Times it doesn’t matter what you call it, the point is the money was raised. As for PwC saying it wasn’t, “just because they are PwC doesn’t make them immune from inaccuracies”. After all, he argues, if the figure was only $700,000, how would you explain a substantial 10-year naming rights sponsorship with Forsyth Barr? Farry also answers other major criticisms. He says the stadium was on time, on budget, “a remarkable achievement because stadiums aren’t known for meeting their [planned price] but this one has”; former deputy mayor Syd Brown says Farry deserves a “commendation” for that. But others say it only met the $198m target price by excluding costs: the catering fit-out eventually cost $6.1m, some of which was demolishing newly built walls to accommodate kitchens. PwC said this over-run should have been referred back to council. Another $7m of “variations” included wi-fi, phone system, replay screens, toilets and temporary seats. Farry says the stadium came with a “particularly high standard kitchen, benchmarked against other stadia” but the tenants wanted something flasher, so had to pay for it; items like phones were always the tenant’s responsibility. The stadium trust’s own budget of $3.7m blew out to $5.4m, a 46 per cent overspend, including $580,000 on advice from Auckland PR firm the Marketing Bureau. Then there’s the budget-busting land purchases at Awatea St, which dissidents claim were inflated. Farry’s cousin John – also chairman of stadium donors Otago Community Trust – was a one-third shareholder in Maxton Holdings, which owned 8 Awatea St; bought for $220,000 in 2001 and sold to the trust for $1.6m in June 2008, with a clause – signed by Malcolm Farry – guaranteeing other landowners on the site wouldn’t get a better deal. In November 2008, John Farry told D-Scene: “That property is a piss in the bucket as far as I am concerned. It makes absolutely no difference to my life at all”, a quote he later asked not be used. This part of the project, says Malcolm Farry, was always going to be complex and time-consuming and ultimately, land purchases are a negotiation. Critics claim the stadium is smaller than expected: of its 30,500 capacity, only 17,350 seats are permanent, with temporary stands either end. That might breach the old NZRU minimum standard for All Black tests of 30,000 seats, but fortunately, the union told the Star-Times they’re now more flexible. Farry says, again, his opponents are guilty of wilful misinterpretation: the seats aren’t temporary, but “relocatable” to enable the venue to host rock concerts. Dunedin city councillors are settling into their monthly meeting this afternoon amid calls for resignations because of budget blowouts on the city’s new Forsyth Barr stadium. A full public gallery has come armed with placards saying “Resign” raising them high in the air each time one of the pro-stadium city councillors stands to speak. Dunedin ratepayers were told last week they would have to stump up millions extra for the stadium. Councillors will be discussing the six-month-old stadium’s financial woes this afternoon. Read full editorial including comments to The Press. I have always been amused by the childish and slightly embarrassing competitiveness that exists between New Zealand’s various towns and cities as expressed by its mayors and city councillors. You know the sort of thing, where any time there’s the chance to be seen to have the advantage over another centre some local elected representative will wantonly laud it over the other. Read full opinion including comments to Stuff. Read full article including comments to The Press. Dunedin City councillors have been warned that not only is the city struggling to finance its brand new stadium, it may also not be able to afford to maintain the controversial venue. The report recommended any surplus cash flows generated by the DCC or its holding company, Dunedin City Holdings Ltd (DCHL), over the next 10 years, go to reducing stadium debt. “That is mind-boggling,” Cr Lee Vandervis, a stadium opponent, said. Another recommendation has the DCC pushing stadium debt from 20 years out to 40 years. “That adds an obscene $115 million in interest charges to the cost of the Stadium,” Vandervis said, “and the figures say we must push out to 40 years because it is no longer possible for DVL to repay the debt over 20 years. Vandervis was also steaming over a proposal that council consider deferring maintenance on the stadium for five years. “That is saying that basically we’re broke – let’s not have any money put aside for any maintenance. We might not have any for the next five years,” Vandervis said. “For a $200m plus stadium building, to not have the money available for maintenance, especially for teething problems you quite often get for a new and quite innovative structure, is just downright irresponsible,” he said. The report also recommends the DCC consult with ratepayers for a $1m hike in rates to reduce 40 years of planned borrowing for the $198m stadium. The committee meets on Monday to discuss the report. Dunedin Mayor Dave Cull said he had not read the report and would not comment before it had been discussed by the committee anyway. Carisbrook anti-redevelopment campaigner Lee Vandervis has lost his Dunedin City Council (DCC) seat after the counting of special votes. Vandervis believes his Carisbrook chickens have come home to roost. Preliminary results for the city’s Hills Ward put him four votes ahead of Fliss Butcher. However, the final vote tally has seen him fall behind Butcher by the same amount, with 1976 votes to her 1980. Vandervis told Butcher yesterday: “The delay of a recount is not something I will trouble you with”. His bid for the Dunedin mayoralty also failed. Encumbent Peter Chin was re-elected, gaining 21,412 votes in the final count compared with Vandervis’s 6825. Vandervis told The Press he had no illusions his high-profile campaign on future plans for Carisbrook and pledges to limit council bureaucracy and ensure open decision-making and consultation before major spending were responsible for him losing both bids. The DCC passed a series of resolutions in June to set a path for the Carisbrook Stadium Trust and approve a $188 million budget for the project, proposed for a new location close to Otago University on the road to Port Chalmers. “The people of the Hills Ward, like the rest of the city, had plenty of opportunity to know where I was coming from. “I had the audacity to put forward strong views regarding the stadium. “I don’t blame people for taking the party line. “I tried to the best of my ability to tell them what was going on, and I’m pleased about that. “I tried to save the ratepayer that incredible drain on the finances. He did not believe “any of Dunedin’s elected representatives have made any difference at all to any decisions” made by DCC chief executive Jim Harland. City Hall would be “having an enormous party” now he was leaving, Vandervis said. In an email to Butcher, he said she might now be the “lone voice against the stupidity of the proposed stadium”. However, Butcher said she would not be carrying the Carisbrook torch for Vandervis. “It never was a hot topic for me,” she said..
“I came out ages ago and said I don’t think it’s a good idea, and that’s all there is to it. “The business case doesn’t stack up, (and) I think it’s in the wrong place.